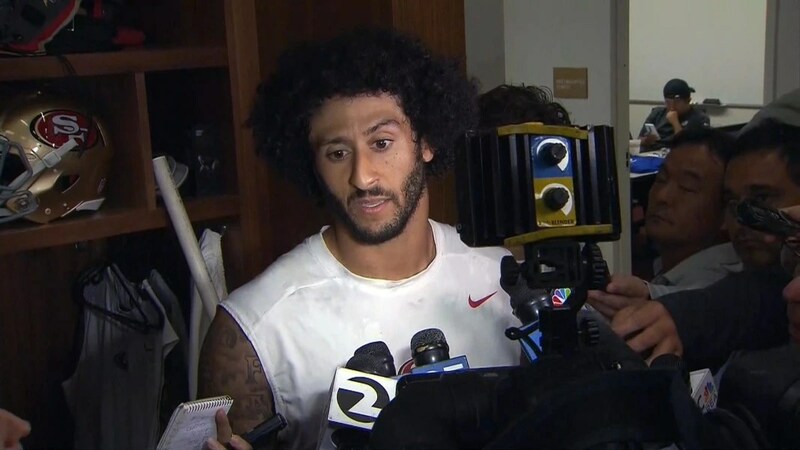 Quarterback (QB) for the San Francisco 49ers Colin Kaepernick made a strong statement for what he called and “injustice toward minorities,” for recent police shootings. During the national anthem of a football game, the NFL QB decided to sit on the bench instead take part in the pledge. Once the game ended he conducted an interview with the press stating why he decided to sit. Immediately there were mixed feelings from many who agreed with his decision as well as the criticism. But what fueled him to do so. What really got to him? This has been a topic for the past couple of years and now he’s coming forward; why? One theory is one that popped into my mind immediately. Colin is a native of Wisconsin, where recently another shooting took place in Milwaukee. The police shot and killed a young Black male which set off protest across the city. Police squad cars and other vehicles were turned over and set on fire. Giving that Colin is a native to the state, he could have felt the topic now hit close to home. Or maybe it was the result of held in frustration over time, almost like the powder cafe effect. But does the mass media play a role in the mental anguish that leads to these various forms of protest. Because these types of interactions have been taking place with law enforcement and the community throughout history, but never has it been part of our 24 hour news cycle. When something on on television is consistently played over and over again, it can make a matter appear worst than it really is at the moment. Still, Colin is not an anomaly. He just gets added to the many public figures that have come out recently in light of shootings by the police. Now, on the other hand you have the critics, who counter the sentiment toward the police. One argument states that police are on edge because of the environments they are forced to service. The neighborhoods are rot with criminal elements and behavior that can rival the death toll south of the border with Mexico’s drug cartels. Police and their supporters would go on to state that police are responding to the growing violence in these high crime areas. Another view is that more Black males kill each at higher rates than police. Logically and logistically this makes sense, especially when looking at a city like Chicago. Which at the moment has a crime rate higher than it has seen in over two decades, as well as higher than some poverty stricken international cities. But does that mean the deaths are justified. Are the police killings justified because someone in the community kills. Meaning, “Hey, they shoot each other, why is it such a big deal when I kill ’em?” Well the other side would say, that one death never justifies another death. But the most obvious reason is that the guys who shoot in the community are not protected by the state. Their shootings are not upheld by the law. These men kill, yet they are thrown in prison for lengthy sentences if not given the death penalty for their crimes. In the opposing view of the police, people would state cops never get into trouble. If they do, it could only be described as a slap on the wrist or amount to an unpaid vacation. But should we be prompted sit for the pledge of allegiance? Should we not view the United States flag as a symbol of freedom? Let’s analyze this pledge. The end of the pledge states, “With liberty and justice for all.” The justice for all is the portion of the pledge which prompted Colin to sit. So how did the military troops get brought into this equation. Aren’t they fighting for our right to stand and protest. Don’t they fight and die so we can have those unalienable rights to express how we feel when we feel social injustice has taken place. However you view this, both critics and supporters of Colin both are in alignment with freedom in America. He has the right to sit and not stand. But understand, that just as much as he has the right to protest, the opposition has a right to disagree. ← Interracial Dating: Does It Matter?